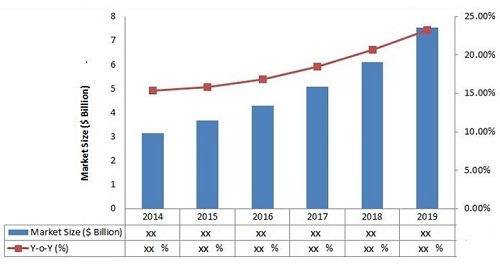 [174 Pages Report] The total data center automation market is expected to grow from $3.16 billion in 2014 to $7.53 billion by 2019, at an estimated Compound Annual Growth Rate (CAGR) of 18.97% from 2014 to 2019. Increasing usage of internet and networking globally has significantly augmented the demand for more storage space, computing power and complex networking. This demand has given rise to scaling up of infrastructure in the existing data centers, thus increasing the capital expenditure and operating expenditure for data centers and the enterprises. This scaling up has also increased the complexity in networking, unification and pooling of resources in data centers. All these factors play crucial role in the growth in demand in the global data center automation market. To overcome these issues of rising demand for resource pooling, simplification in networking and overall management of data centers; innovators have come up with the sophisticated concept of data center automation which is also known as Software Defined Data Centers (SDDCs). This concept helps traditional data center users to scale up their existing infrastructure seamlessly, thereby resulting in reduced overheads. This also helps in unification of server storage and networking, along with simplified management of all resources. Data center automation helps to overcome the obstacles of scalability, flexibility, manageability, and reduced costs, which is in turn helping enterprises and service providers in managing their existing data centers and networks. Another major driver for data center automation market is its inherent capability of interoperability which enables solutions to get implemented on any hardware irrespective of the vendor or manufacturer, with an added advantage of multi tenancy support. The future adoption of automation technology is expected to be in heterogeneous environments and hybrid clouds, with more focus on software defined security. The market research report analyzes market dynamics, future roadmaps and global trends, and also provides competitive intelligence and forecasts over the next five years. Some of the key vendors occupying the market are HP, IBM, Oracle, Dell, Brocade, Cisco, Microsoft, CA Technologies, VMware and BMC Software. The data center automation research report discusses the strategies and insights of the key vendors in the industry and also provides in-depth study of driving forces and challenges. The report also analyzes the global trends and future growth potentials across different regions. The rising need for virtualized data centers and the incessantly increasing data traffic has posed as a threat to enterprises and infrastructure providers alike. This is considered as a strong driver for the global data center automation market. The increased cost overheads and complexities in the networking environment have given way to the adoption of data center automation, thereby aiding companies in cutting down their operational and capital expenditure (CAPEX). Typically, the infrastructure cost of data centers rises while scaling up from their existing architectures. This often leads to several complexities and interoperability issues between different components, thereby increasing demand for a seamless software defined environment. The SDDC comprises software defined storage (SDS), software defined networking (SDN) and software defined server/compute, wherein all the three components of networking are empowered by specialized controllers, which abstract the controlling plane from the underlying physical equipment. This controller virtualizes the network, server and storage capabilities of a data center, thereby giving a better visibility into data traffic routing and server utilization. This, in turn results in a controller driven environment, which accentuates data center performance while ensuring significantly low operating expenses (OPEX). This report gives detailed insights into the global data center automation market split across various regions, type of solution and type of end-users. While the solutions include Network automation, server automation and storage automation; by services: installation services, consulting services, and support services; by end users: SME, Large enterprise; by regions: North America (NA), Asia Pacific (APAC), Europe (EU), Middle East and Africa (MEA) and Latin America (LA). The report also emphasizes on key adoption trends, evolution of data centers, future opportunities and business cases in this innovative market. MarketsandMarkets expects an increasing adoption of SDDC solutions, as major vendors are aggressively investing and rigorously working towards building cost effective data center solutions, in an effort to reduce the overall cost incurred by end-users. The total data center automation market is expected to grow from $3.16 billion in 2014 to $7.53 billion by 2019, at an estimated Compound Annual Growth Rate (CAGR) of 18.97% from 2014 to 2019. The figure given below highlights the market size and Y-O-Y growth pattern of the market, for the forecast period from 2014 to 2019.